Programmable Encoder IC PT2241 is a tri-state programmable encoder utilizing CMOS Technology specially designed for remote control applications. It encodes address and data codes into a coded waveform suitable for RF modulation and CAN provide up to 311 Address which may be designed by a one-time programmable process. PT2241 CAN support up to 4 Data Bits, thereby reducing inventory pressures. It is housed in 8 or 16-pin DIP or SOP Package. The pin assignments and application circuit are optimized for easy PCB Layout and cost saving advantage. By Princeton Technology Corp. This is one package pinout of PT2241,If you need more pinouts please download PT2241's pdf datasheet. 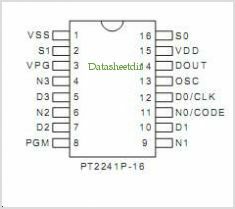 This is one application circuit of PT2241,If you need more circuits,please download PT2241's pdf datasheet.